Otitis externa, or inflammation of the external ear, is a very common ailment in dogs. Often there is an infection present. Symptoms may include an odor or discharge from the ear, scratching or shaking of the head or ears, soreness, and/or swelling of the earflap. However, some dogs show very few symptoms and will only be diagnosed when a doctor examines the ear with an instrument called an otoscope. Yeast or bacterial infections will complicate otitis externa; however, these germs do not start an ear problem. 1. A complete history to help identify an initiating cause. 2. A complete dermatological examination since frequently the ear infection is part of an overall skin problem. 3. A thorough otoscopic examination because it is important that the ear canal is evaluated for swelling, discharge and/or ulcers. The eardrum also needs to be visualized to determine if a middle ear infection exists. 4. A cytological exam (cell examination) to identify the presence of organisms (yeast or bacteria). This is very important because certain bacteria are hard to treat and need long-term therapy. Also, ear mites can be identified from this test. 5. A deep ear flush under general anesthesia to completely clear the ear canal and make certain the eardrum is intact. 6. A video-otoscope using “high tech” equipment to visualize the entire ear canal, eardrum and occasionally the middle ear on a TV monitor. Through this video-otoscope, we collect samples from the ear canal and apply medications. We can also take pictures of the ear canal and eardrum, which assists in monitoring response to therapy. 7. A bacterial culture and susceptibility test if the infection is chronic or the eardrum is ruptured. If the eardrum is ruptured, the middle ear will need to be flushed out using the video-otoscope and skull radiographs +/- a CT scan. These procedures are done under general anesthesia. 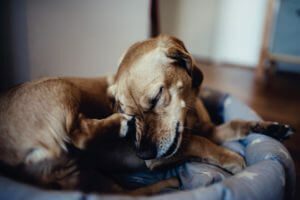 Even though there are many underlying causes of otitis, most cases respond quickly to treatment especially if the initiating cause is addressed. 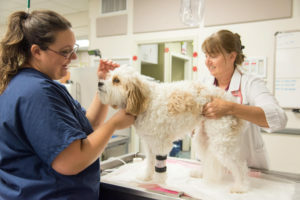 The sooner the pet with otitis is seen, the easier (and less costly) the treatment may be.